Your Yogyakarta tour package must be more unforgettable once you include cultural attraction within your itinerary. When there are a range of traditional custom ceremonies practiced in Yogyakarta every year, Tumplak Wajik is considered as one of the most unique ones that worth a peek. This tradition is actually a part of the popular Sekaten ceremony. We can say that Tumplak Wajik is a tradition which marks the opening of Sekaten ceremony. By this tradition, it is hoped that all the ceremony agendas will go well from the first to the end. To experience all the ceremonies, your Yogyakarta tour package may last for a week since Sekaten is a long ceremony with various agendas. The preparation of Tumplak Wajik tradition itself is held for 3 days before the peak of Sekaten ceremony. Generally, this tradition is about making wajik, a diamond-shaped traditional snack made of steamed glutinous rice, which is going to be used for the main event of Sekaten ceremony. It’s for sure an event that you shouldn’t miss within your Yogyakarta tour package. This custom ceremony is started with praying together for asking salvation. The prayer is usually led by Penghulu of the Yogyakarta Palace. 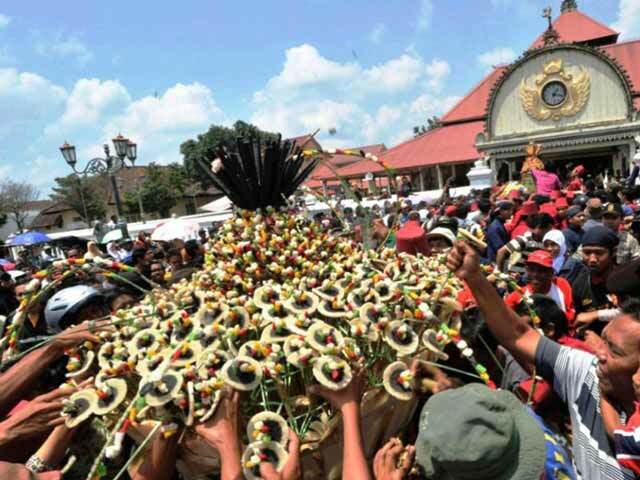 After praying, the wajik will be formed to create a structure of Gunungan Estri. There will be a lot of unique things to see during the process of Tumplak Wajik tradition, so don’t miss any on your Yogyakarta tour package. Well, there is no doubt that you can expect for a lot of things to see during the series of Tumplak Wajik tradition. You can expect to see the making process of Wajik which is going to be used for Sekaten Ceremony and many other things. To make you have more imagination about this Yogyakarta tour package, check this out! On Tumplak Wajik tradition, the wajik is selected as a symbol of the tradition since it is made of glutinous rice and palm sugar. This ingredient symbolizes strong relationship. On the ceremony, you won’t see a usual wajik since the one made for Sekaten ceremony has 40 cm diameter and it is shaped like a huge upside-down bowl. If you book a Yogyakarta tour package during the Sekaten Ceremony, you will be able to witness the Tumplak Wajik tradition which is then followed by Grebeg Mulud and other series of events. There is no doubt that all the ceremonies you experience here will create such unforgettable memory that may last forever on mind. Now, to make sure that you can get the best experience on witnessing Tumplak Wajik tradition, book your tour from a trustworthy company like Jogjabromotour.com. You can discuss about your intention to watch the tradition and how the best solution to take for it. So, whatever kind of Yogyakarta tour package you need, book them from www.jogjabromotour.com!